1F Felt: Roofers return to undertile felt. As we better understand the impact of changes to the design of the building envelope as a whole, some experts are predicting a return to traditional 1F felt. When they replaced 1F as the top selling roof felt, breather membranes were considered the wonder product. The fact is that today, most roofers would not consider anything else. But as we begin to understand some of the limitations of breather membranes, many roofers and architects are predicting a change back to traditional undertile felt. As well as reducing the impact of wind lift, roofing felt is designed as a secondary barrier to rain and snow. Your roof tiles or slates should be doing most of the hard work, the real benefit of roofing felt kicks in when something goes wrong. If the worse happens, and a slate or tile is damaged, roofing felt will channel the rain harmlessly down to the gutter. Roofing felt also minimises pollutants, dust and insects from entering your attic. Great news for those wanting to safely store their bits and bobs (and that strange wooden mask that Aunt Mildred brought back from her travels) out of sight in the attic! 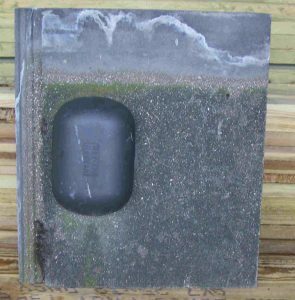 Traditional undertile felt (slaters felt), manufactured from hessian fibers coated with bitumen was used on thousands of properties over many decades. Offering long life, good protection, value for money, slaters felt was also considered simple to install. Then a double whammy hit. Changes to building design started to improve air-tightness. Houses started to become warmer and less ventilated. At the same time, lifestyle choices started to create more steam (think showers, cookers and washing machines). Some tile vents are just plain ugly. All this warm, water laden air had to go somewhere – up. Entering the roofspace, the warm air would hit the cold bitumen felt and then condensate. The result: Damp attics, rotting timbers and calls to insurance companies. The simple solution was to ventilate. Manufacturers started to produce an enormous variety of tile vents, slate vents, ridge and fascia vents. The downside – they cost money, can be complicated to install, and some look downright ugly. So the breather membrane was born. Offering similar protection, breather membranes function a bit like a Gortex jacket. They prevent water from getting in, but small holes in the skin of the breather membrane allow all that moisture laden water to dissipate out of your roof space. Or so we thought. Breather membranes were originally sold as a roofing felt that needed no additional ventilation. The reality, according to the National Home Building Council who insure most new builds, is something else. They state breather membranes should be correctly installed to protect the sheathing and frame from moisture, allow water vapour from within the frame to pass into the cavity. The truth (as always) probably lies somewhere in between. Many roofs fitted with a breather membrane, get along just fine without the need for any additional ventilation. However in some situations, breather membranes become overloaded with moisture. Seemingly random events combine to create this problem. New build properties becoming occupied in cold winters are the primary concern. North facing roofs seeing less sunlight in winter, poor sealing of ceiling lights, complicated roofs located over kitchens or bathrooms are others. Following even better changes to the design of houses, many manufacturers are now stipulating that their breather membranes should be installed with additional ventilation (the very thing that they hoped to replace). Others require taping at walls or eaves, or the use of plastic vent strips. That’s fine if your builder or roofer understands the detail. But what if they don’t? Another impact of the use of Breather Roof Membrane occurs when bats decide to use your roof to roost. The simple fact is that bats and breathable roof membranes just don’t mix. The fine fibres of a breathable membrane fluff up like cotton wool, entangling the bats with dire consequences. So why the return to traditional bitumen based roofing felt? We spoke to some of our local roofers and architects and asked for their opinions. 1F felt reduces wind lift. Bitumen felt significantly reduces wind lift. Because of this, slates and tiles are much less likely to be blown away during strong gales. Roof felts manufactured from hessian / bitumen are much less likely to entangle bats. Undertile felt is easy to install. Simply unroll and nail onto the rafter. Breather Membrane require’s additional ventilation. If your going to fit additional ventilation, why not just install 1F anyway. Heritage projects stipulate original or traditional materials. 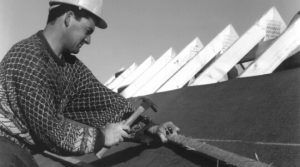 Hessian weave bitumen 1F roofing felt is still manufactured in virtually the same way as it was 100 years ago. Tried and tested over many decades. Has the wheel turned back towards traditional slaters felt? Do you use or have preferences on one type of roofing felt or another. Please share your views on breathable membrane and the return of 1F felt?